This year has seen a particularly harsh dry season in Belize. Many fires are burning all over the Belize and Cayo Districts as I write this. This morning my sister and I were having breakfast when we heard a crackling sound behind the house. When we rushed outside, a wall of flames and a blanket of smoke were coming our way. Because the area is so dry, it quickly became a huge task. These days more and more people in Belize are making their homes in wooded, rural, or remote areas where they enjoy the beauty of nature and the environment. But these people face the very real danger of wild fires. Wild fires often begin unnoticed and they spread quickly, igniting brush, trees and sometimes homes. In a wild fire, every second counts! Luckily for us in Crooked Tree we have not lost a single home yet. Wildfires can occur anywhere where it is dry and wooded. In Belize an estimated 30 thousand acres have been destroyed in the Mountain Pine Ridge and many more acres of the Pine Ridge forest of the Belize District this year. The majority of these fires have been accidentally set by people burning yard clippings or rubbish. But the weather conditions such as the extended dry spell directly contribute to the constant occurrence of wildfires. 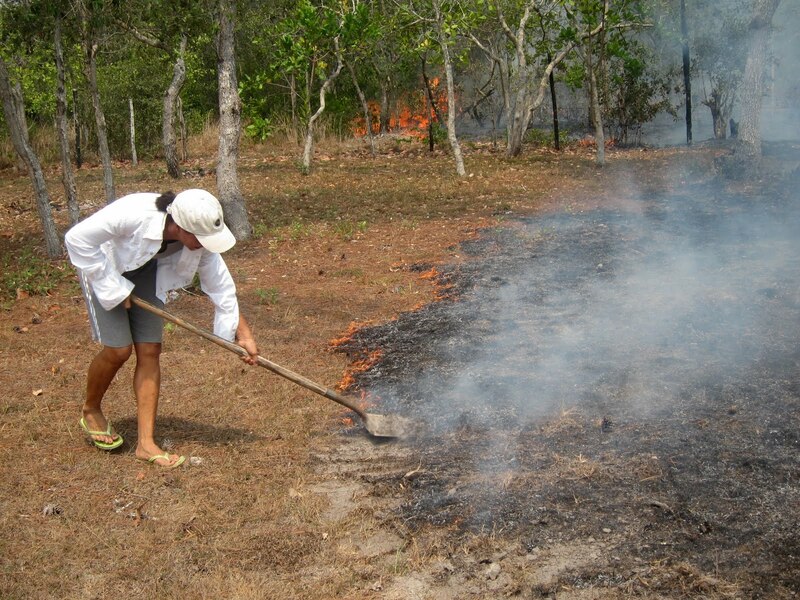 The most common type of the wildfires in Belize are surface fires which move slowly and burn the forest floor, killing animals and causing extensive damage to vegetation. We have had a few sprinkles, but it has occurred mostly in the Maya Mountains. For now, Belizeans are anxiously awaiting the rains. Hi Lin, I enjoyed the artist song, beautiful. I know for sure that you are having a blast. Come back soon. Great pictures and "hat's off " for the great Village Community spirit to keep the fires at bay. I can't forget the days when the Forestry Department was well equipped to fight forest fires. Reliable transport,shovels,machetes,axes and knapsack sprayers to douse the flames. Now we seem to have a Forestry Department in name only." Dah weh happen to wi? "Our pristine forest is a great attraction to tourists. Let's try to keep it that way. I can relate to your firefighting efforts. I had to do the very same at our yard in Crooked Tree the Wednesday following Easter Sunday. If it were not for some very timely help from Eduardo and his boys, instead of the half that was burnt, the entire yard would probably have been affected. I owe those guys big thanks.